Every designer knows that for stage, studio and film set, lighting is key to ambience and comfort. 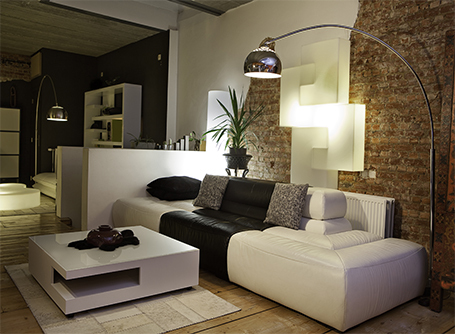 We look at some lighting mistakes to avoid in your own domestic setting. For a large space, you need ambient (overhead) lighting, but it doesn’t complete the job. Nothing beats the intimacy of a table lamp when you’re curled up with a book, or a standard lamp illuminating a dark corner. Don’t ignore the ability to control the mood with dimmer switches. They can make all the difference to a dinner party or a quiet evening at home when you don’t need your living space lit up like an operating theatre. Big savings can be had with low-energy light bulbs even though they’re more expensive up front. One word of caution however; they may not work with dimmer switches, so choose your bulbs for the appropriate fixtures. At the planning stage, think about where shadows will fall. This can be crucial in a kitchen or bathroom. A great tip for bathroom mirrors is to place lighting on either side rather than above for a calm and warm effect. Make sure the size is right. A dining room chandelier that’s too small or an oversized table lamp will look uncomfortably out of place. It’s difficult to judge by eye in a showroom, so always take a tape measure. A common mistake is to place table lamps a little too high so that you’re blinded by the bulb when you sit beside it. Always check before buying the fitting or shade that it will avoid the dazzle factor. Pantries, closets, and larders need lighting too! A single overhead light will merely create shadows, so supplement it with strip lights, lighting bars, or cabinet lights. They will make the space warmer, friendlier, and easier to use. Recessed lighting, particularly in a kitchen, contributes to a clean, fresh feel, but it is almost never enough. You’ll end up with insufficiently lit walls and corners, so if you like the elegant recessed look, add some ambient lighting too. Naturally, you will choose light fittings to complement your color scheme. But wall colors that are too dark will defeat any amount of carefully placed illumination. Your best lighting solution could be to redecorate in a paler shade. Supplement ambient lighting with standard lamps, table lamps, and pendant lighting to create a sophisticated ambience and comfortable feel in your living space. At the planning stage, think about where shadows will fall. Some may be part of the scheme, but should be avoided in kitchens, bathrooms, and small spaces.